Getting rid of mosquitoes in the yard during warm seasons will usually include sanitation, treating standing water and liquid insecticide applications every 30-60 days. 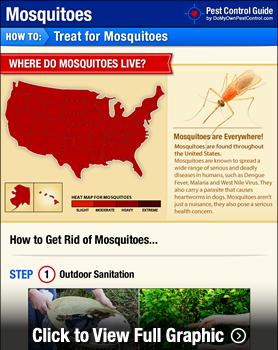 Following the treatment plan will help keep mosquitoes to a minimum and will allow you to use your outdoor areas without constant mosquito bites. While it is unrealistic to expect 100% control of all mosquitoes, you can expect to reduce the mosquito population to a manageable level that will allow you and your family to enjoy your yard. During the mosquito inspection you likely found many water sources where mosquitoes can lay eggs and develop. In all places where it is possible, such as flower pots, pet dishes, rain gutters, bird baths, etc water should be emptied frequently to prevent mosquitoes from breeding there. Trees and bushes should be kept pruned and grass should be kept short to limit resting areas for adult mosquitoes. Other yard debris that is gathered in shady areas and that can retain moisture should be removed from your yard. In areas where you cannot control water collection you do have another option, larvicides. Larvicides work to stop these aquatic immature mosquitoes from maturing into biting, breeding adults. Containerized ponds, animal watering troughs, flower pots and other areas that do not have flowing water or water that can seep into the ground or into other bodies of water can be treated with larvicides as well. How often you apply the larvicide will depend on the product chosen and the amount of rain in your area. There are different types of larvicides. One type is an insect growth regulator which bombards the developing larva with a juvenile growth hormone mimic that stops the larva in young developmental stages to prevent maturity. The second type of larvicide contains a special bacteria that affects the larva's ability to eat. Larvicides also come in different formulations. You can use solid dunks or bricks, water soluble packets or granules. Which larvicide you choose will be based on the areas you are treating so it is important to read the product label prior to purchasing the product. Monthly insecticide spray applications in the yard will greatly reduce the number of biting adult mosquitoes. There are many concentrated insecticide products that are labeled for mosquito control so it is important to choose one that is labeled for use on the areas you plan on treating. You may have noticed more mosquito activity in the morning, early afternoon and again after the sun goes down but not so much during the middle of the day. This is because the adult mosquitoes hide out during the heat of the day. They hide on the undersides of leaves on trees and bushes, in dense brush, tall grasses,under the overhangs on structures, under decks and in other moist shady areas. Concentrating your spray applications to these areas will help insure your application is effective as it is known that adult mosquitoes will land on these treated areas. Be sure you are getting the spray to the underside of the leaves on the foliage you are treating. Simply spraying the tops of the leaves will not be effective. If you are located in an area where the mosquito population is especially high we strongly recommend you add an insect growth regulator to your insecticide spray solution. Insect growth regulators help sterilize the mosquitoes and make some eggs inviable. The addition of the insect growth regulator can also reduce how often you need to reapply products to once every 60 days as the reproduction cycle of the surrounding mosquitoes will have been interrupted. DoMyOwn.com has put together multiple mosquito control kits to make picking the right products easy for you and your specific needs. Pyrethrin based insecticides offer a short term repellency to keep mosquitoes and other annoying insects away from the treated areas. You should resist the urge to coat your entire yard and home with the insecticide spray application. Doing this will reduce the mosquito population but it will also reduce the beneficial and predatory insects on your property. Reducing the beneficial and predatory insects could allow pest insects to move in after time. 522 of 555 people found this article informative and helpful.